Need design as well as development? We’ve got you covered. Having both design and development done by BFC means we’re with you every step of the way, as the folks at the League of Conservation Voters discovered to their benefit. All our sites are built with multiple devices in mind. Visitors can easily view our sites no matter what the platform, as illustrated in the graphic above. Mobile use of websites exceeds desktop use at this point (see statistics here) and we lean heavily on frameworks that adopt a mobile-first philosophy, guaranteeing great performance on even the tiniest platforms. 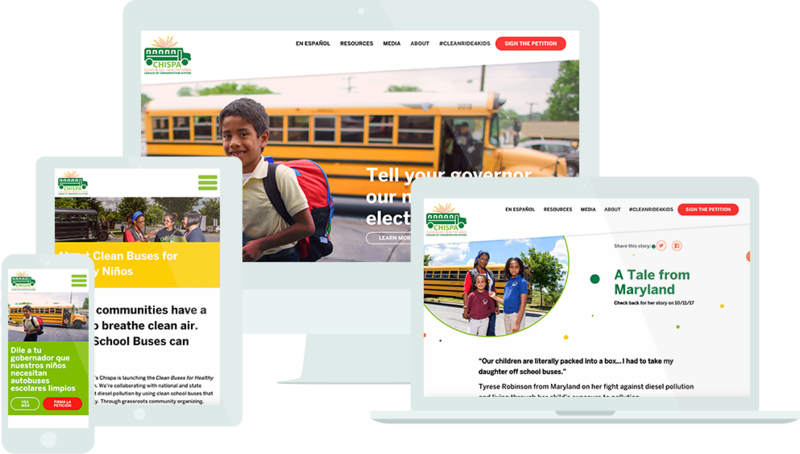 The homepage of the site was built using the Joints WP theme, which allowed us to integrate a responsive framework that adapts to multiple devices. The designs called for angular header and footer sections–an effect partly achieved by using SVG objects–and the ability to call up a modal popup window for video content on the homepage. 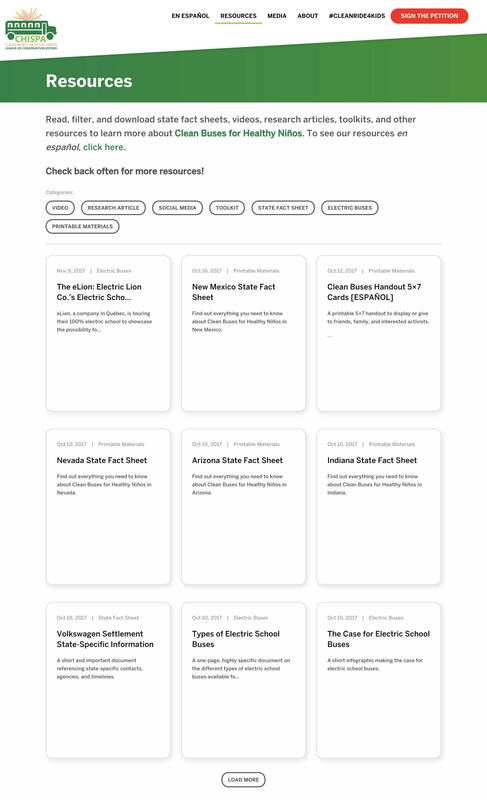 Modern CSS properties such as Flexbox were utilized to help organize and align the design, a Twitter feed was integrated, and a carousel slideshow plugin (Slick) was used to draw attention to the individual stories pages that form the bulk of the content on the site. Kids & communities have a right to breathe clean air. Clean School Buses can help! That’s why LCV’s Chispa is launching the Clean Buses for Healthy Niños campaign. 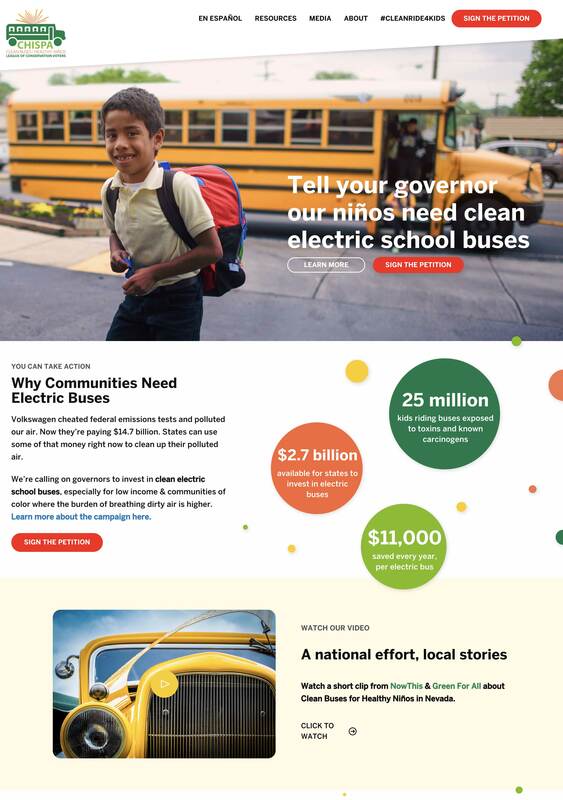 We’re collaborating with national and state partners to fight diesel pollution by using clean school buses that run on electricity. The Resources and Media pages fundamentally work off the same template, which allows LCV to stack up tiles relating to each topic. Once clicked, users are either sent to an internal page or an external link, depending on how they are configured in the WordPress backend.